For decades, companies across the world have trained their learners in classrooms. The instructor-led training (ILT) format is highly effective and has helped organizations impart training of high quality. However, the ILT format is inflexible and cost-ineffective. A new learning methodology was needed, which could meet the corporate training needs of the 21st century. The rapid advances in the IT sector soon provided a solution – e-learning. The web-based learning format provides the best value for your training investment. A study by IBM showed that for every $1 a company spends on e-learning, it can receive $30 worth of productivity.1 No wonder, many companies are moving their classroom training resources to the web. This is an important reason for converting ILT resources into online resources. Unlike classroom training programs, e-learning courses can be accessed anytime, anywhere, on the device of your learners’ choice. This feature of the online learning medium allows your learners to come up with their own convenient learning paths — learners can study whenever, wherever they want. In other words, e-learning helps them become masters of their own learning. Furthermore, classroom scheduling issues are eliminated and learners can have uninterrupted access to learning resources, even after the classroom. Inconsistency is one of the biggest limitations of the classroom training methodology. This is because different instructors have varying knowledge and experience levels, and as a result, classroom learners across different locations don’t receive consistent training. You can overcome this problem and deliver consistent, high quality training to your workforce by converting your ILT materials to online learning resources. This is because the online learning format is trainer-independent, and the quality of training is not at the mercy of the instructor’s abilities. Furthermore, you can standardize the training delivery process, enabling your people acquire knowledge and skills better. This is a major driver for moving classroom programs online. As companies move to new shores, they are faced with a key challenge – imparting effective training to their staff in non-Anglophone countries. This need can be met very effectively using the online training format. Web-based learning resources can be rendered in the native languages of learners seamlessly. Find out more about translating e-learning courses in this comprehensive resource. Conversion of classroom training materials into e-learning courses helps you reduce your carbon footprint. The web-based learning format reduces the need for paper, and this helps conserve forests. Research by Open University of the United Kingdom showed that e-learning produces 85% fewer CO2 emissions than standard face-to-face or distance learning. Find out more on how the web-based learning medium helps you impart training in an environmentally-sustainable manner. Let us now look at a couple of best practices of converting ILT resources to online courses. Many companies make the mistake of simply publishing their ILT resources such as classroom handouts, PowerPoint presentations, and so on, as they are, to the web. This is due to the perception that these classroom training materials contain all the subject matter necessary to impart good training, and the perception is wrong. ILT resources just act as supplements in a classroom. The actual subject matter comes from the instructor with demonstrations, examples, and engaging activities. So, the PowerPoint slides are only cues for the instructor. Publishing them as they are will not be of much use. So, you need to make these trainer-led instructional materials “e-learning ready” before moving them online. Fill the gaps in the learning content and incorporate appropriate visual elements, interactivities, assessments, and multimedia components. Apply adult learning and instructional design principles to this content. After adapting ILT resources to the web, use the right authoring tool to transform the learning materials into online courses. You need to remember that the online learning format is not a substitute for your existing trainer-led instructional methods. 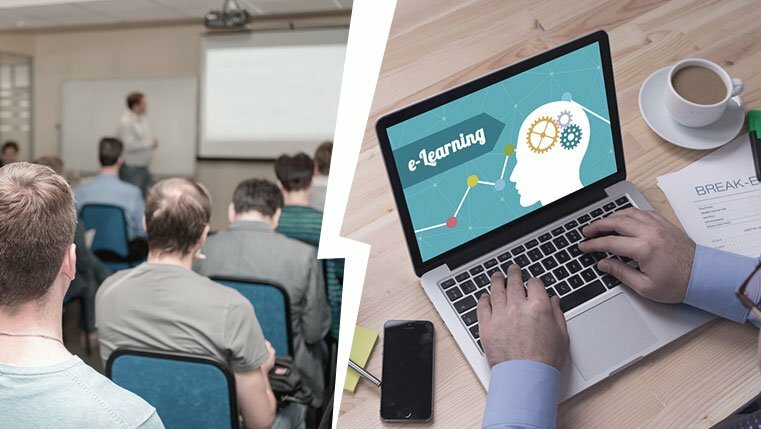 Companies go for e-learning to avail the benefits of technology in training and not because the training method, which has been used for ages, is ineffective. So, blend the web-based learning medium with your current classroom training, instead of replacing it. Another reason to blend and not replace your current training method is change management. Your staff members may not readily accept an abrupt shift from classroom training to online learning, and even a well-designed technology-enabled learning resource cannot yield the desired results if your employees are averse to it. Launch e-learning in small steps and give them time to pick up, accept, and get comfortable with this new training method. Converting your ILT materials to e-learning courses helps you impart flexible, cost-effective training. Follow the two best practices when you move your classroom resources online, to get the best results.